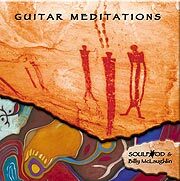 A soothing musical journey that joins the amazing acoustic guitar of Billy McLaughlin with the ambient soundscapes and synthesizer of SOULFOOD. Together these award-winning artists create meditative, musical masterpiece perfect for massage, gentle yoga and relaxation! This CD was a NAV finalist for Best Acoustic Album.